been a long, long time since the 80’s, so who knows? it, which just happened to be Zots. Fast forward to about 11:00 that night, the kids and wives are asleep, we’re watching the women’s volleyball finals in Bejing. COACH: “This meeting is over”. So anyway, as we’re tearing through our pounds of random candies, out come the Zots. Basically, they’re little balls of hard candy with a sour fizzy powder inside. The flavors are very good- we tried lemon, grape, and watermelon. Sweet, tart, interesting,…overall, a very tasty treat. Bottom Line: These are good. Probably not an every day treat, but damn good every now and then. Hello gentlemen. 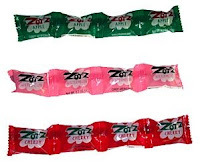 I just love Zotz. Haven’t seen them in a long time. Have one for me!